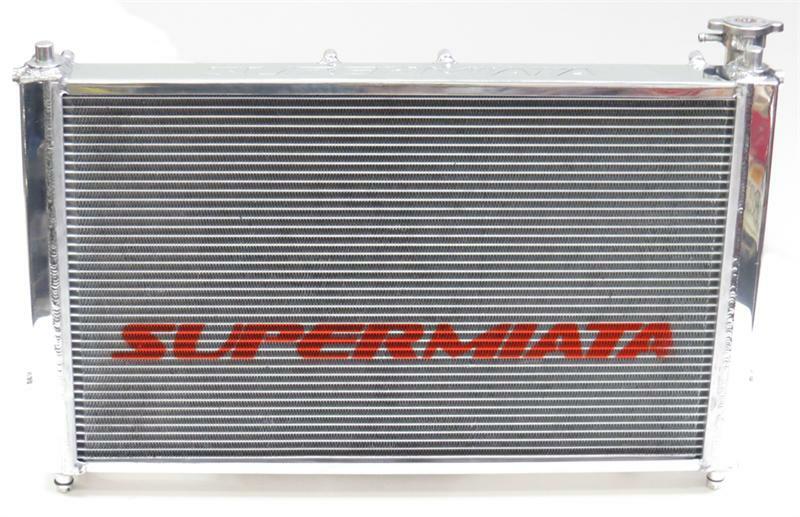 Disappearing SuperMiata Crossflow Radiator? - Miata Turbo Forum - Boost cars, acquire cats. I saw that you were releasing a SuperMiata branded crossflow radiator in July that was in the $300 range. Now I don't see that on your website anymore. Are you still releasing this radiator or should I get something else? Thanks. No, that is FlyinMiatas version. 949 had a version of their own for $300 on the website for a few weeks, but out of stock. A quote from Supermiata's FB page from a post on April 30th, the link is now broken. Coming in July, our new crossflow radiator for the 90-05 Miata. Whether you are running a bone stock NA6 daily driver and tired of hot temps in the summer or have a high horsepower track car, this is what we recommend. Click the link for a sneak peek. Yes, but the radiator had been on the site until very recently. He is questioning why it is gone. It was confusing folks so we hid the page. The SPM crossflow is still in development. No ETA. It is made for Ferraris now to cool brakes. Any updates on the ETA of supermiata crossflow awesomness? I would love to get one of your crossflow radiators before the summer! That was 9 months ago! I bet if Emilio has a concrete ETA, he'd probably tell us. Because we uncovered a few small flaws in the original drawing then discovered the factory didn't actually have the final production drawing, I halted everything. Back to square one with measurements. The OEM baseline drawing was incorrect once I figured out how to measure certain asymmetries that everyone but Koyo assume are symmetric. Before we make any more, I want to be 100% sure every single dimension is accurate and the design will work as intended for every application. First run was maybe 95%. Worked great with some wrestling on install but didn't allow A/C on NB's. Second and all future runs will fit much better and allow A/C on NB's. Again, no ETA. We'll put them on the website when they are in stock, not a pre-order deal. Sorry! ...and hopefully my stupid eBay radiator holds up long enough to wait for that NB A/C version to come in stock. Thanks Emilio, just trying to figuire out if I need to plan on living with the radiator I have for another year or if I can plan on getting your crossflow radiator in by the end of this summer! I won't estimate or promise anything with the crossflow until they are in the building. Consider it a non-product until we announce it in stock in our own CF rad thread. I have one of the first series cross flow radiators from Emilio in my 90 NA. The install was not plug and play as Emilio addressed. It was not not that difficult to install either. As Emilio probably remembers from our earlier discussions this install was not the typical installation. My NA runs a modified LS2 V8 Roadster. The primary issue with the radiator to function was the incorporation of the LS2 steam vent. The steam vent install proved to be a non-issue. My original radiator was the KOYO racing radiator. The cross flow has proved the short time that I drove it in Florida stop and go driving with A\C running to be superior to the KOYO. My first impressions with the cross flow have been much more than satisfactory. Is this release compatible with NB A/C as you mentioned before?